The results of this fundamental research conducted at the intersection of physics, chemistry, biology and medicine have been published in Nature Scientific Reports, one of the most prestigious scientific journals. "The interdisciplinary collaboration of scientists led by Maxim Abakumov, a Candidate of Chemical Sciences and the Head of the NUST MISIS Biomedical Nanomaterials Laboratory, has managed to develop a platform for simultaneous diagnosis and treatment of cancer. The aggregation of diagnosis and therapy at the cellular level - so-called theranostics - is now considered one of the most promising areas in modern medicine. Scientists now [have] to learn how to detect pathogenic cells at the earliest stage of the disease," said Alevtina Chernikova, Rector of NUST MISIS. "We have managed to combine gold (Au) and magnetite (Fe3O4) nanoparticles into a hybrid that has both magnetic properties and is capable of carrying the drug [to a tumor]. It turned out as a kind of 'nanodumbbell' which could become a platform - a universal base - of future theranostics, and we have shown that in our research," said Maxim Abakumov, one of the project participants, assistant professor at RNRMU, and Head of the NUST MISIS Biomedical Nanomaterials Laboratory. "The article considers a model of a mouse breast tumor and shows the possibility to deliver the hybrid Fe3O4-Au particles to the tumor, loaded with the anti-tumor drug doxorubicin. 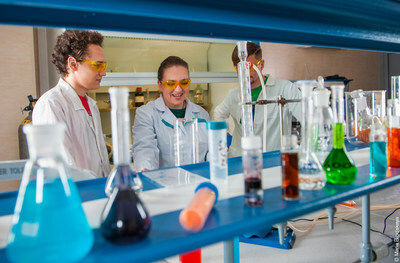 The drug is released inside the tumor and has a therapeutic influence", added Mariya Efremova, the project's co-worker, junior research assistant at the Laboratory for Chemical Design of Bionanomaterials for Medical Applications at Lomonosov Moscow State University, and an engineer at the NUST MISIS Biomedical Nanomaterials Laboratory. It is possible to place almost any drug (in place of doxorubicin) into the "nanodumbbell," and this makes this hybrid an ideal platform to detect tumor cells and deliver drugs; previously proposed methods were only suitable for certain types of drugs and only worked on certain types of cancer cells. Such versatility allows us to hope for the emergence of a new generation of treatments for malignant tumors in the coming years. According to the most optimistic researchers on the project, it will be possible to proceed to pre-clinical trials in just two to three years time, as there is a few years' of work remaining to be completed before clinical trials on real patients. However, the concept of theranostics has still not been applied in clinical practice anywhere in the world, although Russian scientists are on the front lines of this area. "As a scientific discipline, theranostics is now developing very quickly. The proposed platform demonstrates impressive and diverse effectiveness in lab conditions, however, it still has a long way [to go before getting] to patients," said Marina Sekacheva, Head of the Center for Personalized Oncology 'OncoTarget' at Sechenov University. Sekacheva believes that doctors should provide maximum practical support to fundamental scientists and continuously work with them on potentially groundbreaking projects such as this one.